Hoi An Town is the place for visiting and enjoys food. The ancient town has its attraction to anyone by the simple but special features including cuisine. You can find here many different restaurants for enjoying great local food. One of them is such as Hon Restaurant located on Cua Dai Beach. Hon Restaurant has the advantage that the restaurant locates on the beach. 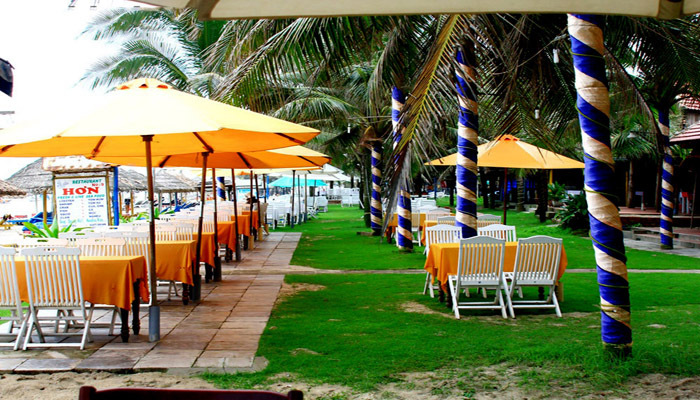 There is the open space for whom who loves to relax and enjoy food on the beach interestingly. The restaurant is the ideal place for the party outside with the romantic and widen atmosphere. For any lunch or dinner here in Hon Restaurant, you can find the excitement closed with the sea. At noon the space is full of daylight when the sun shining. There are the breezes in the afternoon from the sea and the romantic view when the night is falling down slowly together the waves echo gently as the music outside from the sea. It is said that there are two parts separated in Hon Restaurant including the inside and outside serving places. If you love the warmer space, you may choose the inside area for your meal or your party. But you may ask the restaurant sets up your table outside to enjoy your meal in the open space. Hon Restaurant is one of the wonderful places for enjoying seafood. You can fine here the rich menus of seafood in which there are tasty dishes. The typical dishes with seafood here are lobster soup, steam tiger prawn with coconut, green crab fried with tamarind, fried Codfish sauce fish, steam squid, squid grilled with salt, soup rice clam, grilled snail, soup rice oyster etc. Affordable element is the main point that all guests who can find here in Hon Restaurant. Seafood is fresh and rich menu in the restaurant give you the great chance for enjoying and do not worry so much about the price to pay. Depend on your interests; there are some typical dishes which you are advised to enjoying. You have no chance to pay more than your menu chosen because that menu usually satisfies you and you do not want taste anything else.